Last time Shane Black released a photo from his upcoming The Predator, it looked like he was putting together a photo shoot for L.L. Bean’s annual “Crazy Survivalist” catalog. 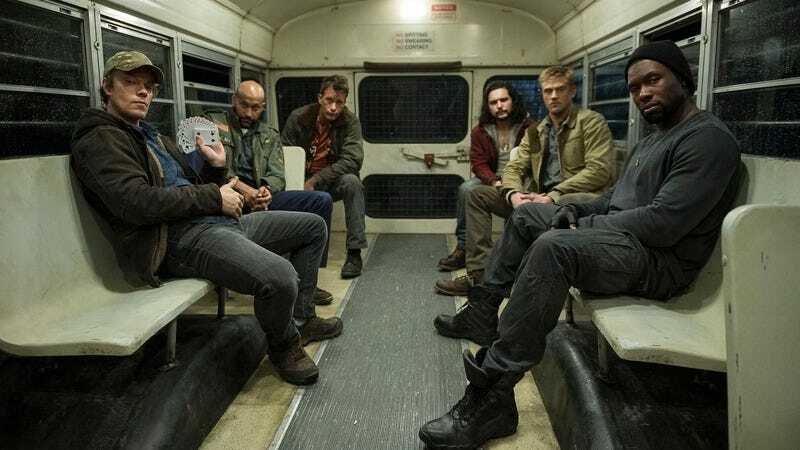 Now, Black has tweeted out another photo from his much-anticipated sci-fi action sequel, this time shoving his cast members onto a bus for the field trip of the damned. Nobody looks particularly happy to be there—not even Game Of Thrones’ Alfie Allen, apparently attempting to to do some close-up magic to wrest the coveted “class clown” award away from Keegan-Michael Key. Maybe Boyd Holbrook and crew have all peeked outside the photo and seen the caption on Black’s tweet, in which he gleefully questions which of them will be the first to die at the digital hands of his CGI monstrosity. We’ll find out for ourselves when The Predator stealths its way into theaters on February 9, 2018.